MADISON, N.J. -- On a night where the defense was stout and the offense made several big plays, the FDU-Florham football team came up short in their opening game of the season, falling to The College of New Jersey Lions 17-13 on Friday night at Robert T. Shields Field. The Devils (0-1) had several crucial miscues, none bigger than a bad snap early in the fourth quarter that gave the Lions (1-1) prime field position, which they converted into seven game-deciding points. The Lions scored two fourth-quarter touchdowns to stake a 17-7 lead, however, the Devils rallied with an impressive seven-play, 68-yard drive to cut the deficit. The FDU-Florham defense came up big and forced a three-and-out with 1:34 remaining, however, on the ensuing punt, the Devils were whistled for their second roughing the kicker penalty of the contest, which allowed the Lions to retain possession and run out the clock. Despite the loss, FDU-Florham received great contributions from many players including freshman wide receivers Malik Pressley (Sayreville, N.J./Sayreville) and Dennis Sutton (Perth Amboy, N.J./Perth Amboy), who combined to haul in 15 catches for 127 yards. Making his collegiate debut, Pressley made nine catches, two of which went for touchdowns. On the defensive side of the ball the Devils put forth a valiant team effort led by the line play of Rich Vazzano (Sparta, N.J./Morris Catholic) and Bill Medve (Randolph, N.J./Randolph). The duo made several key stops throughout the contest, including four tackles for loss. The Devils leapt out to a 7-0 lead midway through the first quarter. Junior quarterback Tyler Maurer (West Milford, N.J./West Milford) engineered an 87-yard drive on 17 plays and completed his first 11 passes of the game. Maurer connected several times with his two new favorite targets Pressley and Sutton but the biggest strike came on a 4th-and-12 pass to running back Anthony Ognibene (Chester, N.Y./Chester Academy) that went for 17 yards down to the TCNJ 10-yard line. Two plays later, Maurer found Pressley in the back of the end zone for their first collegiate touchdowns. With 12:51 to play in the second quarter, Maurer hit sophomore tight end Joe LeBlanc (Linden, N.J./Linden) over the middle, however, LeBlanc fumbled upon contact and TCNJ sophomore lineman John Magi fell on the loose ball in Devils territory. Despite being backed up at their own 23-yardline, the FDU-Florham defense stood tall and prevented the Lions from scoring. Later in the quarter, TCNJ finally took advantage of a Devils mistake as sophomore kicker Colin Cazzetta drilled a 29-yard field goal that was setup by a Zack Vasilenko interception. The field goal concluded the first-half scoring for both sides and the Devils held a 7-3 lead at intermission. The second half opened with three-straight three-and-outs before the Lions put together their longest drive of the game, a 15-play, 56-yard excursion. FDU-Florham's defense dug in again and after a sack by Vazzano, they forced Lions quarterback Mike Machesano into an incomplete pass on fourth-and-long deep inside Devils territory. The drive, which spanned over eight minutes, clearly took a lot out of the home team's defense and on the Devils next possession, a botched snap by the special teams provided the Lions with a golden opportunity. TCNJ took over at the Devils' 23-yard line and sophomore running back Frank Fuccello grinded out four carries for 12 yards, en route to a five-yard touchdown score. Fuccello's score along with the point after, gave the Lions a 10-7 lead. On the ensuing kickoff , the Lions committed two unsportsmanlike penalties, totaling 30 yards, which gave the Devils excellent field position at the TCNJ 31-yardline. However, the Devils were unable to take advantage and ran four plays for a loss of one yard before turning the ball over on downs. From there, TCNJ freshman Khani Glover took over. Having been used scarcely throughout the game, Glover entered with fresh legs and marched through the weary FDU-Florham defense. He accrued 45 yards on six carries and capped the drive with two-yard touchdown plunge. Now trailing by two scores, the Devils offense went to work with limited time remaining. On third-and-15, Maurer, who used his legs effectively to avoid the Lions rush all night long, rolled out and found Sutton on a 26-yard strike. The freshman wideout jumped up and hauled in the highlight reel catch to keep the Devils slim hopes alive. Later on the drive, Maurer hit Pressley for a 33-yard touchdown, their second touchdown connection of the game, which brought the Devils within four at 17-13. Unfortunately, the Devils' point-after attempt hit the left upright and the Lions' lead remained at four. FDU-Florham earned the stop that they needed on the next possession but the aforementioned roughing the kicker penalty nullified it and allowed the Lions to kneel out the clock. Maurer made several impressive plays in his debut and finished the night 29-for-42 with two touchdowns. He also added a team-high 21 rush yards. Junior linebacker Stephen Bick (Toms River, N.J./Manchester Township) led the Devils defense with eight stops, while senior backer Rob Savacool (New Vernon, N.J./Madison) added seven tackles in the loss. For the Lions, Marchesano completed 21 passes for 174 yards and found sophomore wideout Jeff Mattonelli eight times for 48 yards. Glover topped the TCNJ backfield with 12 carries for 38 yards and the lone touchdown. The Devils were plagued by penalties in the contest and compiled 12 for 138 yards. 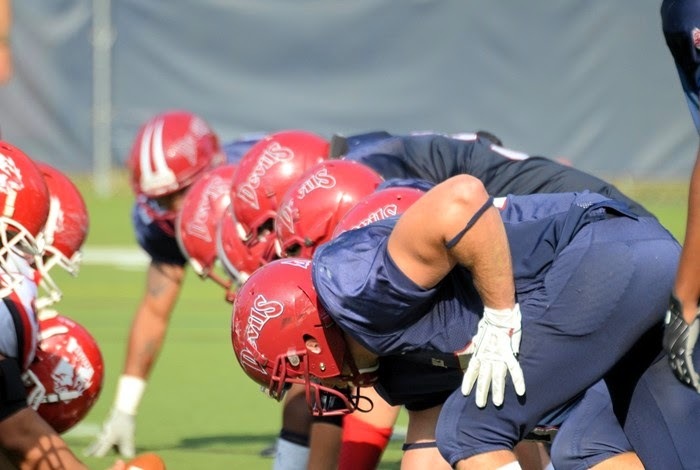 FDU-Florham heads to Dallas, Pa. next Saturday, September 20th to take on Misericordia University (0-1) at 1 p.m.